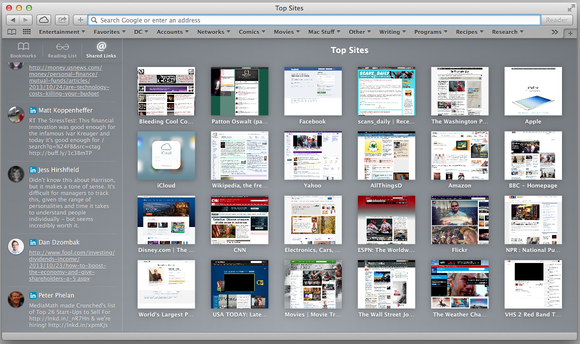 The first thing you’ll see when opening Safari 7 is the new Top Sites window. Dispensing with previous versions’ glossy curviness, the redesigned grid of frequently used pages loads much faster and offers ready access to your bookmarks, Reading List, and new Social Links. 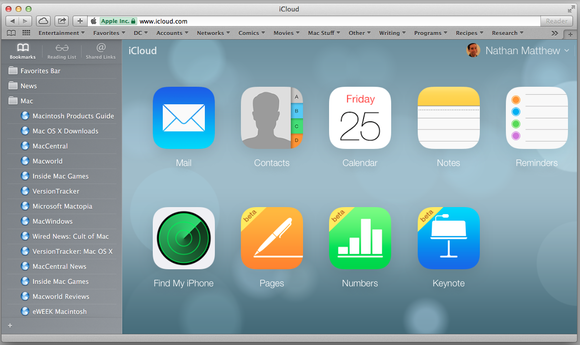 The redesigned Top Sites page is one of Safari’s best interface changes. The latter feature is nice but not essential. If you’ve tied your LinkedIn or Twitter account into your Mac’s System Preferences, posts from your friends or followees will show up here. But where’s Facebook? Did Apple think it’d be redundant, since Facebook updates are already available in the Notification Center? The bookmarks and Reading List work well in the Top Sites window, but not necessarily as a sidebar when you’re browsing other pages. The button that once let you edit your entire bookmark list with ease now summons the sidebar. You can rearrange the order of your bookmarks, or right-click to edit them, but it’s not quite as convenient as it used to be, and it’s harder to see all the links in a longer list of bookmarks, at least on a laptop screen. The absence of a separate Reading List button cleans up Safari’s cluttered interface a bit, but also gives you no handy visual indication of whether it has finished saving a link or not. If the sidebar offends you, you can safely ignore it, and the good old easy-to-edit bookmark list lives on via a Bookmarks menu item. Finally, there’s something off about Safari 7’s scrolling. With my laptop’s trackpad, I noticed a faint but irritating horizontal jitter, as the subtle motions of my fingers dragged pages slightly to the right or left while I scrolled up and down. It doesn’t make Safari unusable, but I hope the next version slays this bug. Bookmarks and Reading List icons now appear in a pop-out sidebar on the left side of the screen. I was much more impressed with Safari’s internal upgrades. The new power-saving features in Mavericks work as advertised; after hours of surfing over multiple days, I noticed that my battery still had a lot more life in it than before I installed the upgrade. Part of that owes to Safari’s new ability to switch off certain plug-in media, which would otherwise chew up computing power. Safari’s guesses about which parts of a page are or aren’t what you came to see could use a little work, but you can turn on deactivated YouTube clips or other Flash-based media by simply mousing over and clicking. The delay is minuscule and never annoying. Don’t mistake it for a full-fledged ad-blocker, but it’ll boost performance without getting in your way. Safari also works seamlessly with the new iCloud Keychain to autofill your credit card information when you’re buying stuff online (provided you’ve set that up). New security features let you decide which sites you do and don’t want to trust when opening non-HTML files like PDFs. And as John Siracusa points out in his epic ArsTechnica review of OS X Mavericks, Safari now offers its own version of Google Chrome’s stability-enhancing sandboxing system; if one tab you have running crashes, the others will remain open. The lack of a Reading List icon declutters the crowded interface a little. 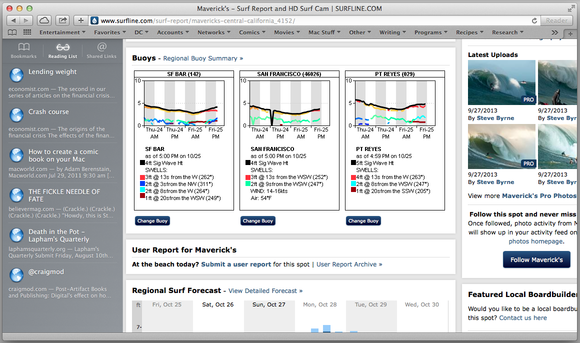 On balance, Safari’s underlying improvements more than make up for its interface annoyances. The new power-saving features make a big and welcome difference I’ve yet to see other browsers match. If you were already using Safari in Mountain Lion, the new edition absolutely merits an upgrade. 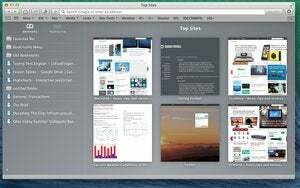 And if you’re a die-hard Chrome or Firefox fan, Safari 7’s performance boost might be worth a try. The battery-saving features in Safari 7 are very impressive and make up for some interface quirks.